The A-Series reputation has been built on quality, reliability and accessibility to all components. Products include air-cooled bare compressors, boosters and vacuum pumps. A-Series compressors include heavy-duty cast iron construction, a counterbalanced crankshaft to ensure smooth operation, and deep-finned cylinders and heads, which quickly dissipate the heat of compression. 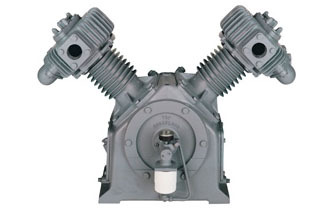 Superior lubrication is accomplished through a gear-driven positive displacement oil pump powered by the crankshaft. A-Series bares and boosters are ideal for petroleum refineries, oil rigs, plant air and vacuum, ore mines, engine starting and well head servicing.